Grass Cutting Carried Out in a Park. Our aim to provide you with worry-free grounds maintenance program. Our maintenance services can be individually tailored to suit your requirements whether that be on a daily, weekly, fortnightly or even more infrequent basis. Our wide range of services include specialist areas like sports grounds and play areas, Hospitals, Residential Care Homes, Local Authorities, Government Establishments, Retail & Business Parks, Hotels and Private Properties. We offer a full range of commercial grounds maintenance and Landscape Maintenance services across such sectors as: Social and Retirement Housing, Prestige Apartments, Trading Estates and Business Parks, Maintenance of grass areas, shrub areas, herbaceous beds, rockeries and rose beds. Click Here to give us your requirements. Do you run a Hotel or Guest House? Is time limited in the Summer months when you are busiest with your business? If the answer is yes then we can help you. We are able to offer an agreed annual maintenance program with either, a weekly, monthly, bi monthly or even quarterly visits whatever suits your needs. This will free up your time to get on with earning a living and looking after your paying customers, a job you will no longer have to worry about. We offer a Council Garden Maintenance Service to carry out maintenance such as shrub pruning, weeding and hedge cutting on Council owned land and public areas. 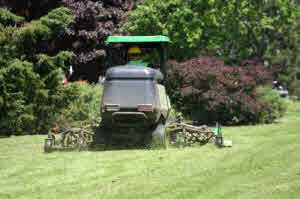 Grass Cutting on School Fields and parks as well as public areas where the grass needs maintained on a regular basis. We undertake a planned program of work throughout the year. Click Here to tell how we can help. Trees are indeed a valuable asset to the landscape. Not only would our planet be a much duller place without them, we also find we owe a great debt to them. In the sense that our open spaces would retain much of the smog that comes from exhaust fumes, and that our air would be far less breathable. We offer a light tree surgery service that will take care of the small jobs that tree maintenance requires, such as formative pruning, crown reduction and limbing, as part of our Ground Maintenance Program. Arboriculture Maintenance. We offer a Local Services Parks and Maintenance Service, for the maintenance of all open spaces this includes, Seafront Gardens, Parks, Recreation Grounds, Council Housing Areas, Cemeteries and Crematorium, and Roadside Verges. We will manage these on a contract basis and undertake a regular program of works to keep local areas looking at their best. Click Here to tell us your needs and see how we can help.